From the Seattle Public Library by Rem Koolhaus to the Scottish Parliament by Enric Miralles and Benadetta Tagliabue in Glasgow, Scotland, public spaces are enjoying a design renaissance. 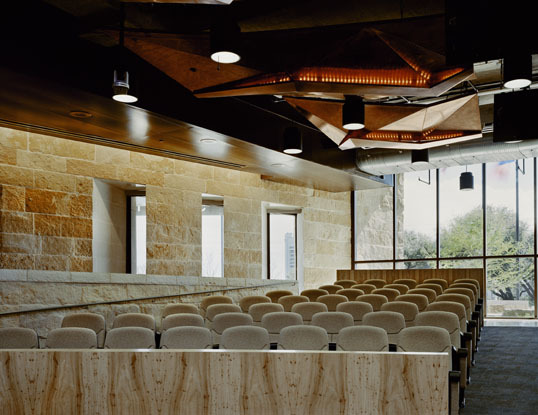 Austin's new City Hall, by lead architect Antoine Predock, is one of the best new examples. Its widely praised, angular design stands in sharp contrast to the unadventurous corporate buildings all around it -- especially with features like a sharp, triangular "armadillo tail" platform protruding from its façade. Far from being an anomaly on the Austin cityscape, however, the building expresses a unique feeling of "Austin-ness." With local partners Cotera + Reed Architects, Predock specified massive Leuders limestone walls, terraces, and footbridges to echo the region's hilly terrain and balcone overhangs. 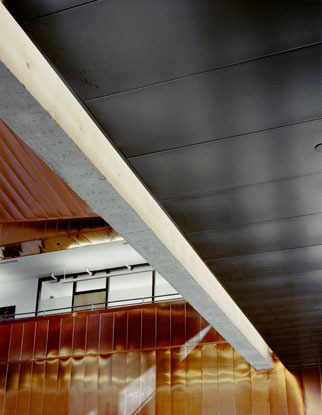 His design also features copper panels -- including specialty metal ceilings from Hunter Douglas -- that make reference to the city's landmark 360 bridge, as well as suggesting the hot Texas sun. 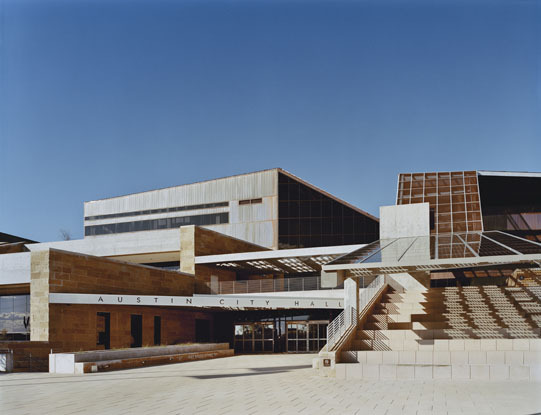 Even the building's unusual shape has been said to capture "mythic Austin -- its rugged terrain, its high-tech orientation... and most especially, its informal motto: 'Keep Austin Weird.'" The four-story main lobby encapsulates many of the building's best qualities. 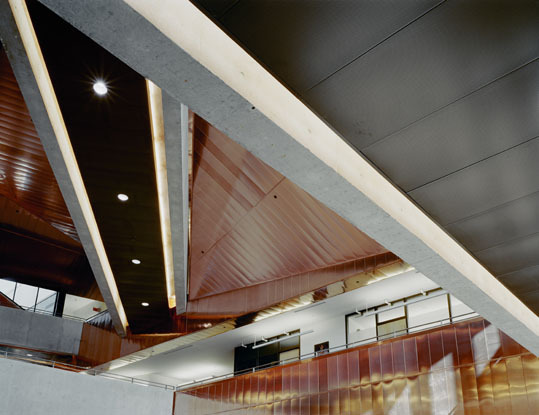 Copper-finish ceilings from Hunter Douglas help reflect light down into the space from a skylight. 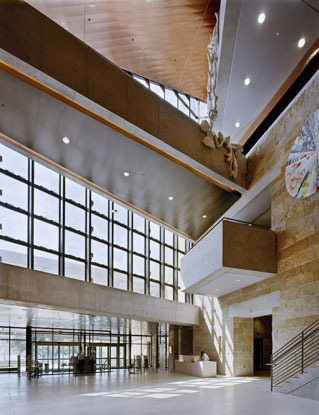 The reflected light illuminates the limestone pedestrian crosswalks that span the space on each building level. The resulting lively, open space evokes a feeling Predock has called "participatory" by making visible the literal movements of government as city employees walk between offices. A "protest window" -- which allows spectators to see the council chambers and be seen by councilmen -- provides an opportunity for Austinites further to demonstrate their interest and involvement. The architects extended the building's energy and activity out to the surrounding city blocks in a number of ways. The "armadillo tail" that juts out over Second Street, for example, represents "a hand in the air," says architect Phil Reed. "It's literally shouting 'Here I am!'" They also created a plaza around the building that features a sculpture garden, seating terraces, and an outdoor performance space. Notably, a canopy covered with photovoltaic cells shades the seating and acts as a solar demonstration project. 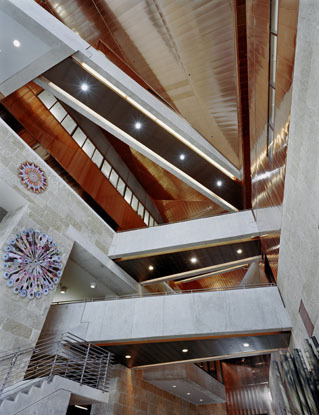 Most of all, Austin wanted its city hall building to fit the spirit of the city, which the Dallas Morning News has described as a "crazy-quilt vitality, that embraces everything from country music to environmental protests and high-tech swagger." Judging from local reaction to the building in the months since it opened, Predock's hip, likable design appears to fit the bill.